Ive been approached by several customers to try and duplicate a jig. The first picture show what I’m working with... 1/4oz do it casting spoon, second picture you can see the casting spoon inside of the bait. My question is... what in the heck am I supposed to use for a “filler” to make this a bigger body jig? Mind you, you can tell that the outside layer is a clear coat, I plan on using KBS, then I’m going to assume paint and did I mention glow? Looking for suggestions on where to start... lastly I need help trying to match the color, I can’t quite get the color down, in the third picture is a close up, I’m trying not to let the black from the scales throw me off... Please help! Is the outside of the bait soft? Can you squeeze it and have it give a little? It looks to me like the basic lead lure was dipped in soft plastic. I can't get the smaller image to expand enough to determine what the colors are you refer to. Maybe re-post the third image solo. Do you inject your own plastics? If so, this looks like gold glitter in clear plastic that the lead lure was dipped into then water to set it. I do the same thing with the larger versions of the same lure. Here's one that was dipped in clear then brushed with hi lite powder, the eye added then re-dipped in clear. It still needed trimming in the picture. Most of those spoons are lead with foil or a sticker dipped in epoxy. Larger manufacturers will use a uv hardened epoxy to speed up production. You could use a 2 part epoxy or Seal Coat. I though of the epoxy coating but the picture looks like the covering is really thick and where the top of it is trimmed it looks like it could go either way. 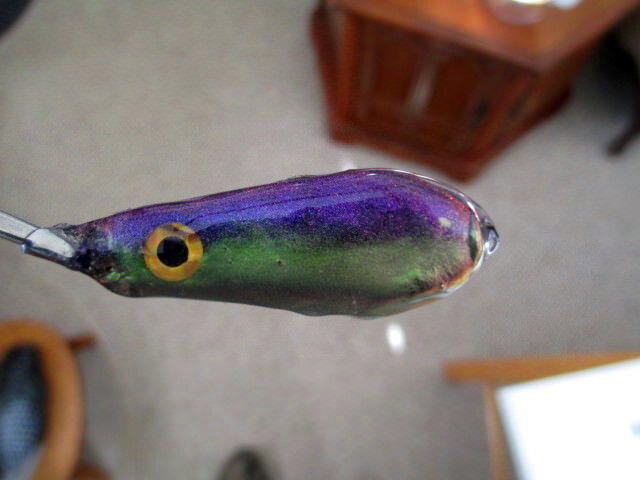 Probably epoxy if its a commercially made lure. That one will be a challenge. The admin suggested foil coating but I can't see that being used given the glow capability. It almost appears to be a white base color, then perhaps a clear coat with glow pigment, then a gold glitter coat and finished with spray for the throat patch and the darker scale pattern and black paint or sharpie to draw the black slashes be fore the final coat of epoxy gets applied. I’ll say you did! That looks awesome.